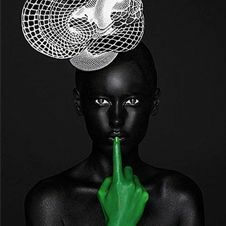 Rankin (born 1966) is one of the most famous and influential British portrait and fashion photographers. The artist teamed up with Jeffersen Hack in 1991, to found the magazine "Dazed and Confused", which developed to become one of the leading magazines of the creative scene in the 90ies, followed by the fashion magazine "Rank" in 2000. His intimate portraits have long been established in the art world and are exhibited in galleries and museums. Rankin is considered to be Heidi Klum´s favourite photographer.